Marty Brooks is a big fan of the original WOR-FM. Through the years he saved some fascinating information from its progressive rock era from 1966 to 1967. Each image is listed here as a thumbnail. 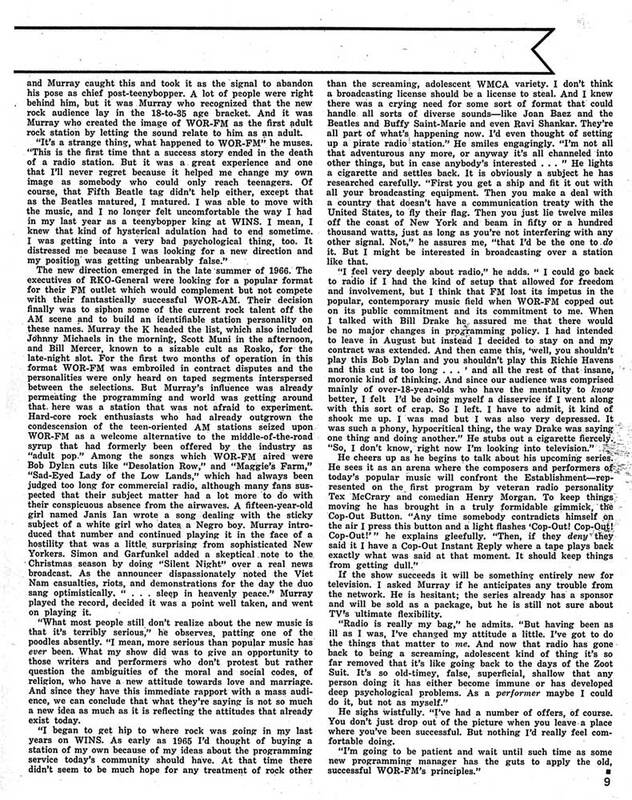 To see a full sized, readable version, click on the image. Milton Glaser was a well known graphic designer and illustrator. There were two posters that Glaser created. This is the one the station selected. 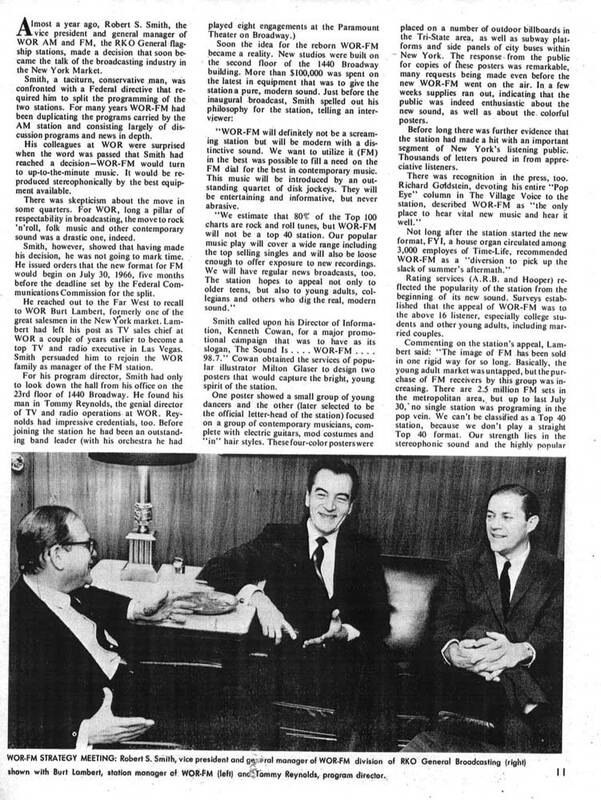 In February of 1967, New York's "FM Guide" did a profile of WOR-FM. 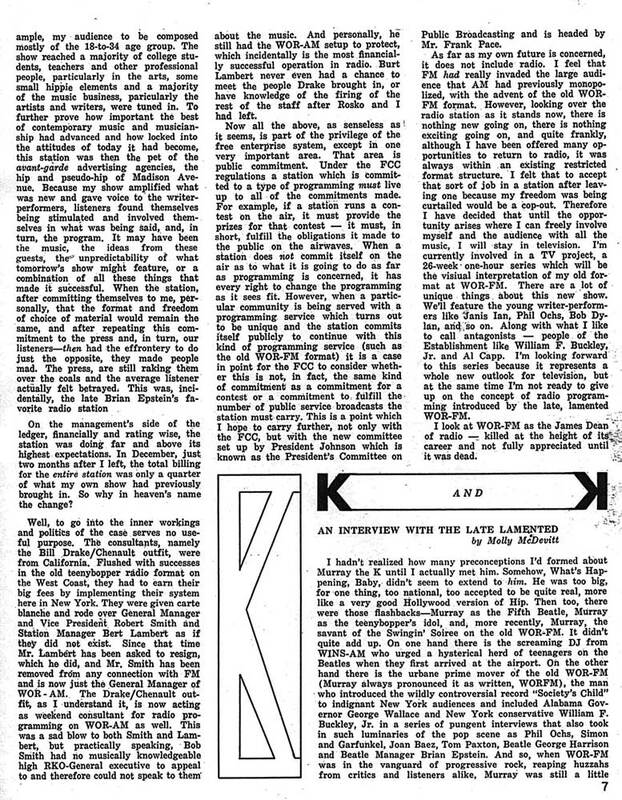 The station was popular with the printed media that year. This story discusses the genesis of the station and those behind its original rock format. First, there so many songs on it. Compare it to WABC's list from the same week. Notice too how many songs are being added to the list that did not appear the week before. 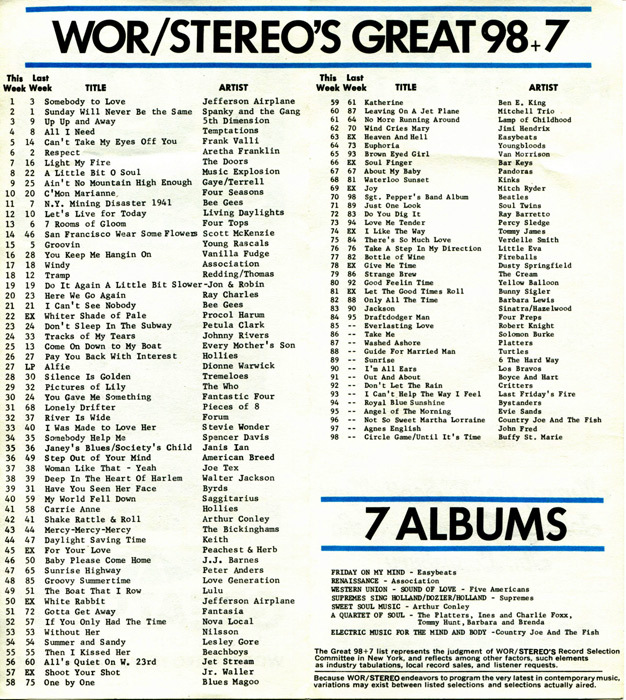 The notice at the bottom also points out that the list, in part, represents the judgment the stations "Record Selections Committee". 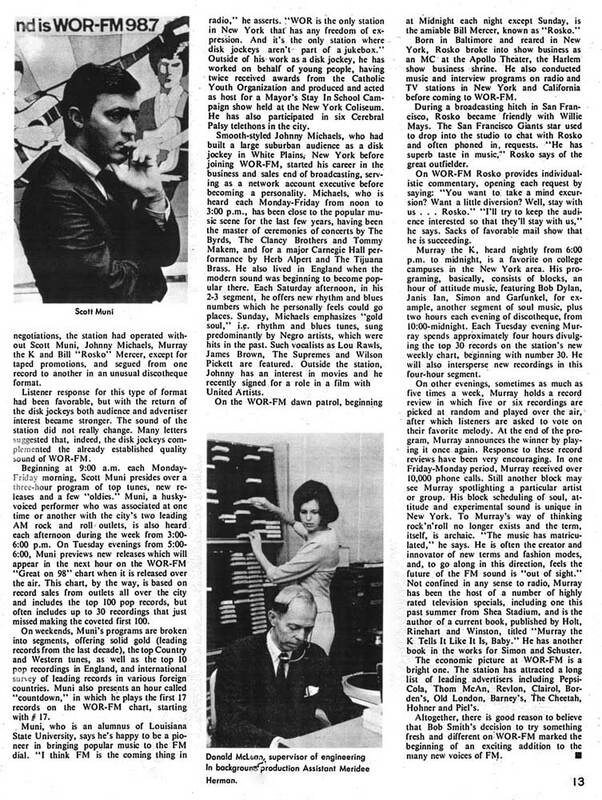 It was not based on just record sales which demonstrates the influence the airstaff had over the playlist each week. It should also be noted that music was played on the station that did not appear on the survey. The individual shows each played different music much of the time. Once again, compare this list to WABC's list from the same week. The list has a separate album section but note that the main list includes the Sgt. Pepper's album. From a format evolution perspective, it's interesting to see how the progressive format was developing. It had its roots in Top 40 but was expanding into a larger playlist with an emphasis on new music. 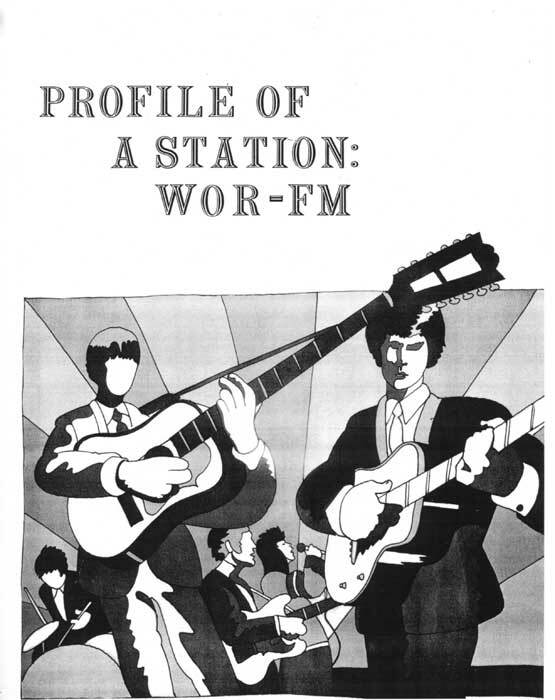 By July of 1967, WOR-FM was attracting a significant audience by FM standards. Interestingly, its on air presentation was derived from classical radio formatting. 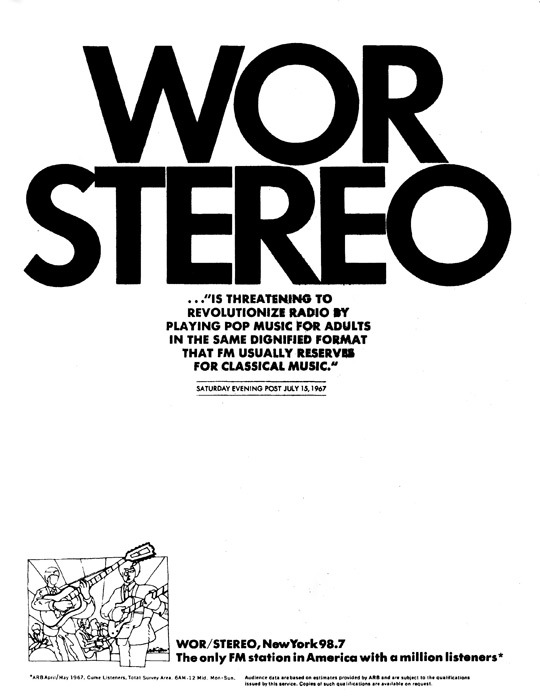 Look at the wording of this advertisement which includes terms like "dignified format" and "classical music". Keep in mind the radio environment this was happening in. 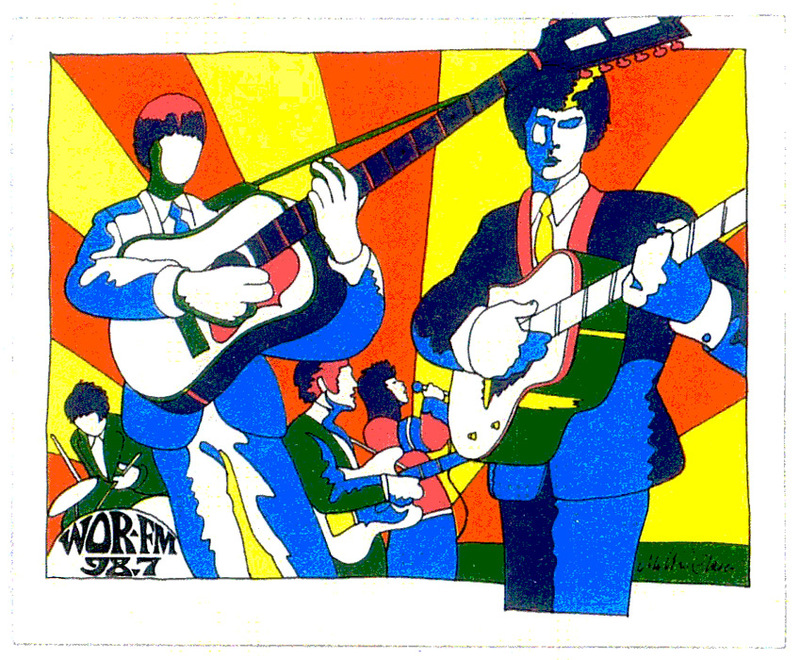 Up until then, rock music was associated with the rapid fire, up-tempo sound of Top 40 radio. This was indeed something different and new. 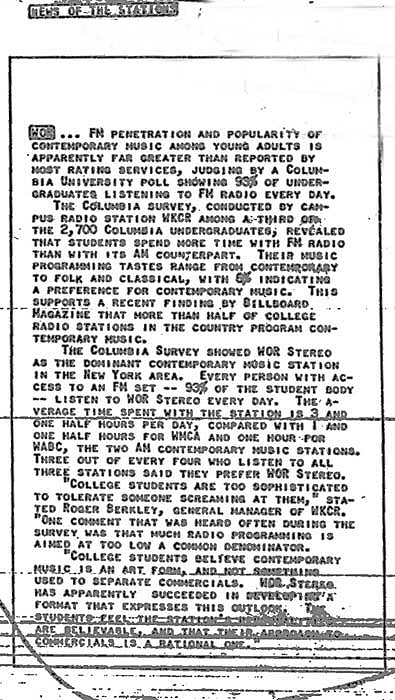 Columbia University conducted a poll of undergraduates that demonstrated that 93% listened to FM radio every day. 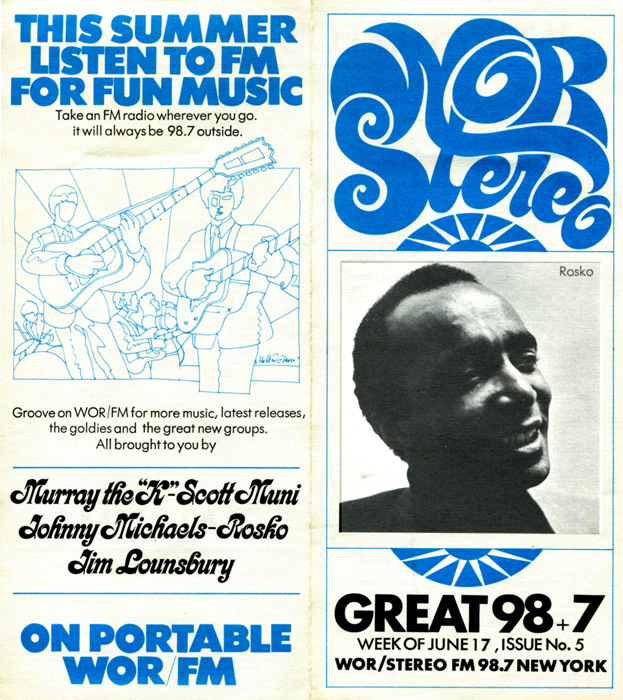 WOR-FM (or, as it was then called, "WOR Stereo") was the dominant contemporary music station in the area. This is the first tangible evidence of music radio listeners leaving AM for FM... a phenomenon that would forever change radio in the coming years. 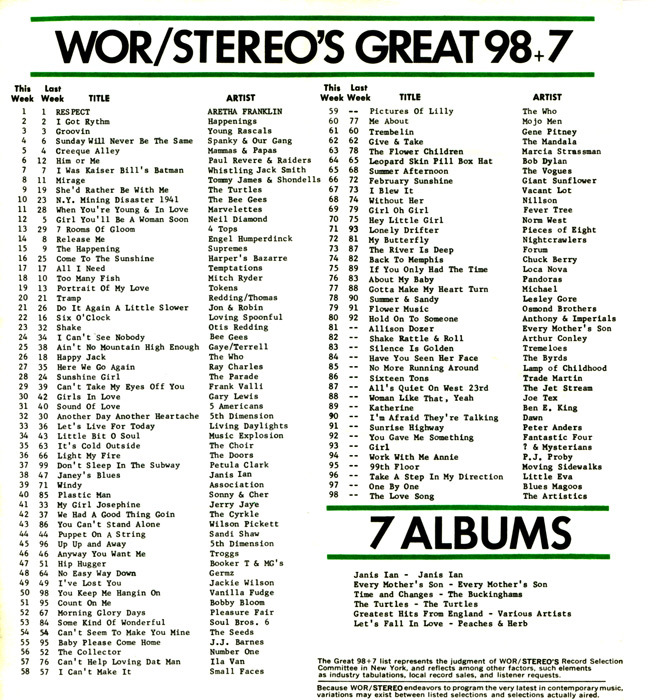 This is a little hard to read but it reports that WOR-FM is shifting away from its progressive rock format. General Manager Bob Smith defends the station's firing of Murray The K by asserting that Murray was putting himself "above the station"
and he gives examples of various infractions Murray allegedly committed. The article also points out the former playlist was 125 records and is now down to 81. Consultant Bill Drake is blamed for the changes. Murray states he has received offers from WMCA and WWRL to return to the air. 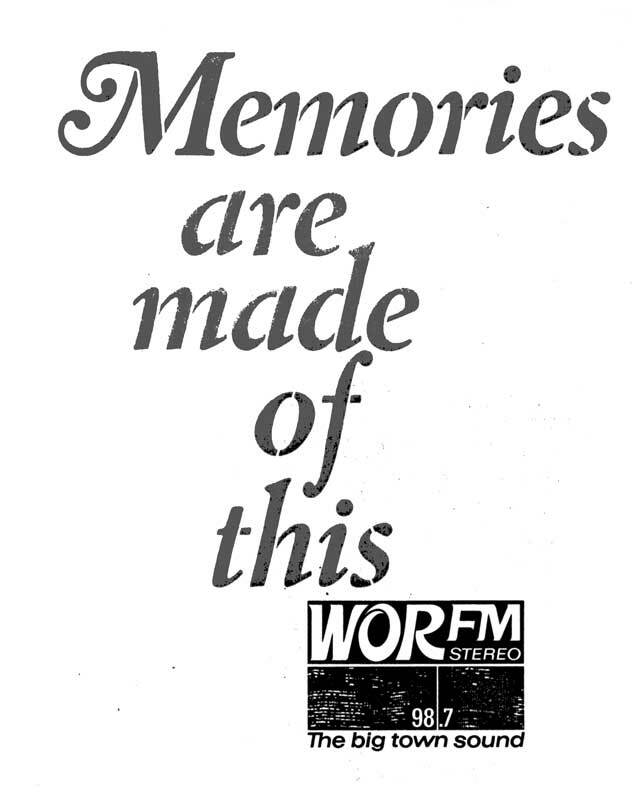 It is suggested that WOR-FM is losing advertisers because of the changes. The article also states that Rosko has left. Michaels firing was apparently the result of following the right wing "An Open Letter To My Teenage Son" with the Joan Baez anti war song "Saigon Bride". 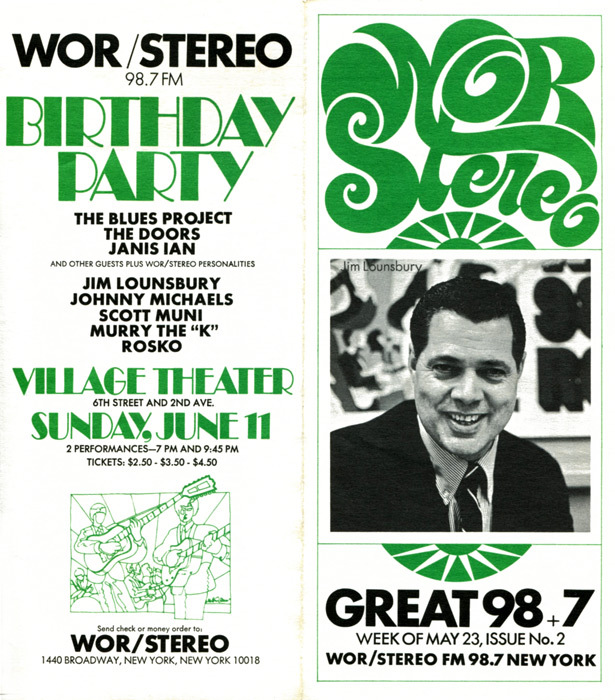 By this time, WOR-FM was under the control of Bill Drake and was playing "Open Letter" every two hours along with an announcement of its importance. Michaels was fired for flagrantly criticizing that announcement by playing the Baez song. In addition, the article is very critical of the Drake influenced hits format. WNEW-FM is mentioned as now playing rock as are individual rock programs on WRVR, WCBS-FM, WABC-FM, WFUV and WBAI. 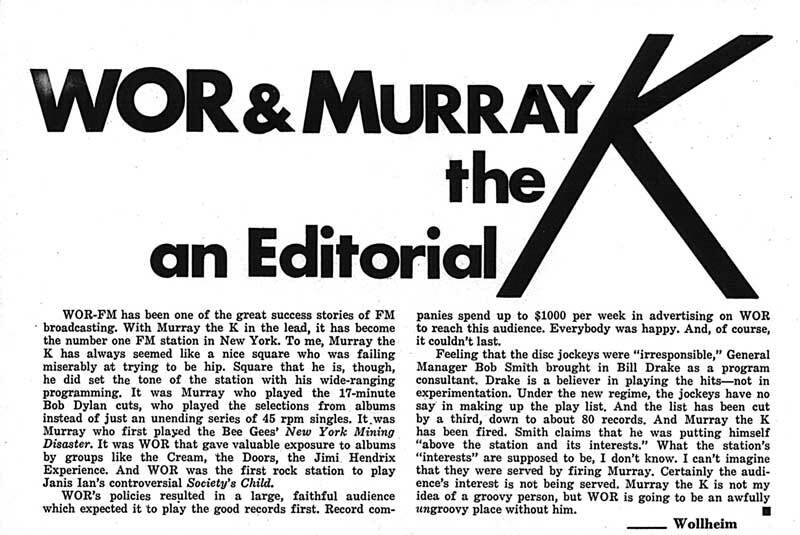 A very critical editorial on the firing of Murray the K and the Drake influenced changes at WOR-FM. It's clear Wollheim was not a fan of Murray's yet defended his role at the station. Murray the K gets a chance to criticize WOR-FM's new management and defend his desire to break and play new music. He discusses his upcoming TV Show ("The Sound is Now") and states his future "does not include radio". 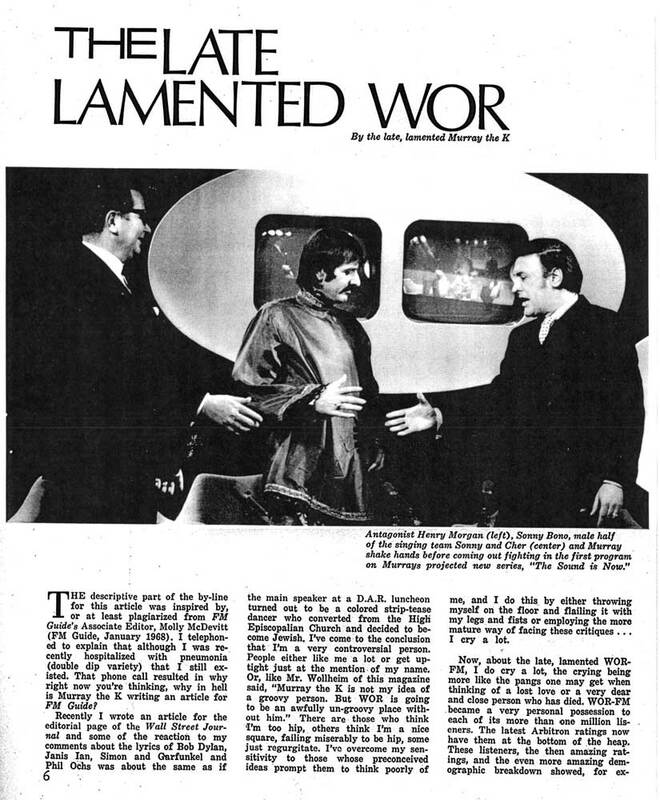 Murray's TV show never aired although a pilot was filmed. His intent was to have people of opposing views debate a topic. One gimmick he planned was a "Cop Out Button" that he would press whenever a someone contradicted himself. 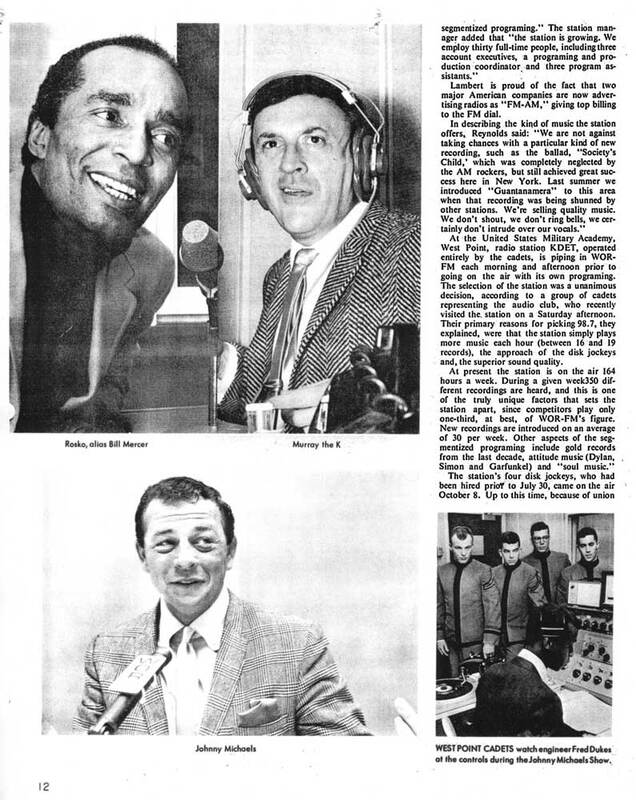 he did indeed return to AM radio on WMCA, then later on WNBC. 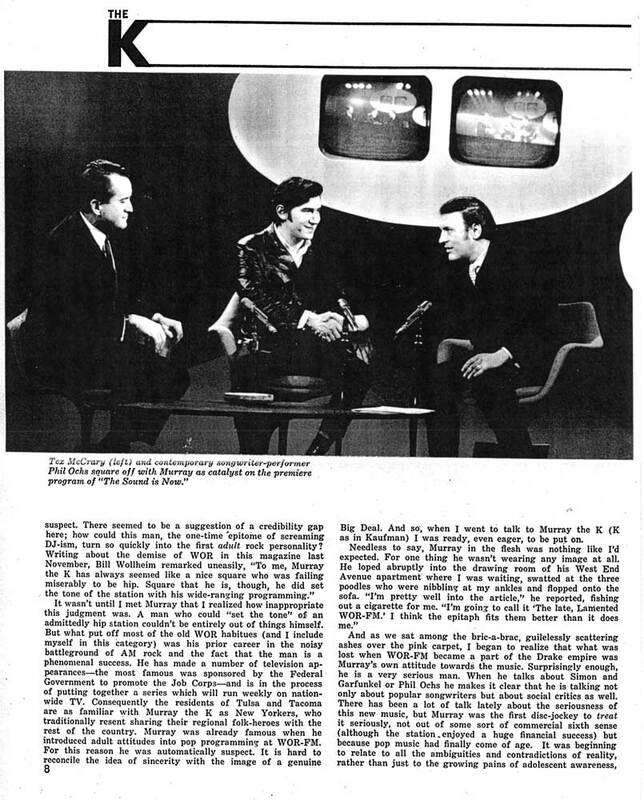 His final program was the syndicated "Soundtrack of the Sixties" in the late 70's. Murray Kaufman died on February 21, 1982. 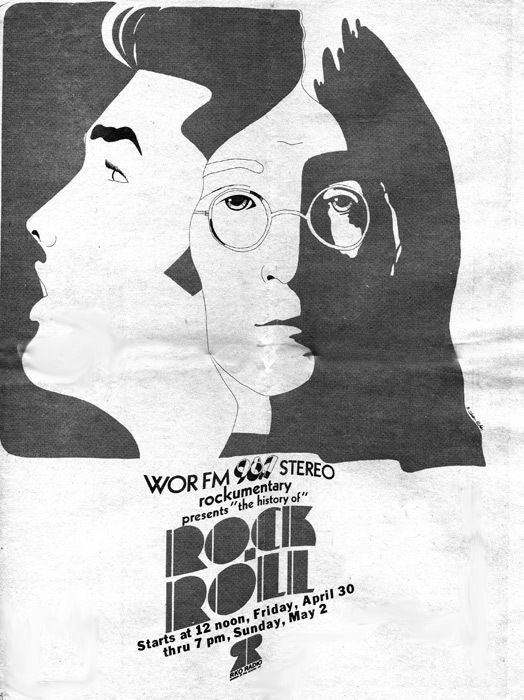 FM Guide Advertisement for the "History of Rock and Roll"
By this time in 1971, WOR-FM had been a full fledged Drake Top 40 station for almost four years. This is an advertisement for "The History of Rock and Roll".